Cozy room of a young girl. A table littered with albums, drawings – a girl likes to draw? The walls are decorated with photographs, drawings. Here is a houseplant, bed, chair. On the chair in front of the images in the corner is the girl herself. The girl’s face, the corner of the room, the ceiling is lit by a lighted lamp. The girl prays, she asks God for something of her own, cherished. In all peasant houses there is always a so-called red corner, in which icons are located – this is the most honorable place in the house. The picture creates a bright mood of hope, faith in the future. 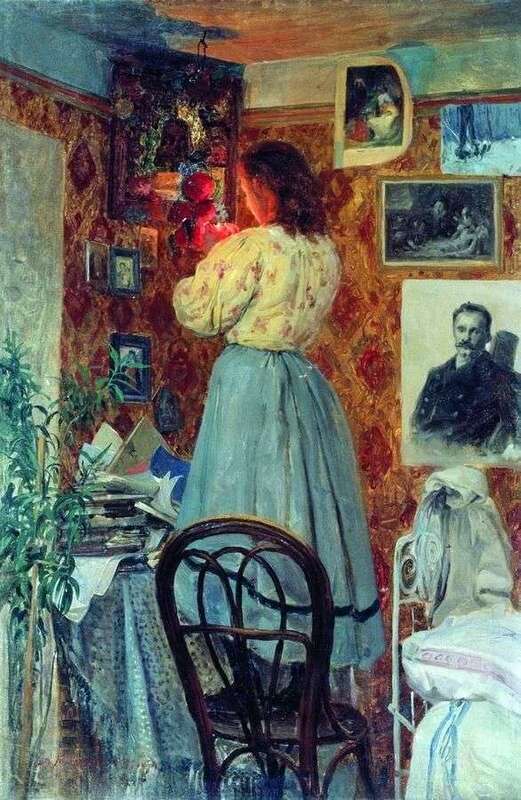 Description and meaning of the painting In the red corner by Alexey Korzukhin.